I know how weary some of you must be when you come across recipes that claim to be the best. But this liver mousse really is the best I have come across to date. And if that hasn’t excited you, you’ll be thrilled to know that it’s one of those things that are deceptively complicated. It may look like many steps are involved, but this mousse is so ridiculously easy to make and makes you look really good at any food-centric gathering. Since the recipe isn’t mine, I guess I’m exempt from the guilt of self-congratulation. This mousse by the great Michel Richard came to my attention a little over two years ago. A downsizing friend asked me whether I wanted to have her brand new copy of Richard’s jumbo-sized book, Happy in the Kitchen — a gift from her friend who obviously had no idea she couldn’t and wouldn’t cook. Now, asking me if I want a free cookbook is like asking Dagwood Bumstead if he wants a sandwich or Cookie Monster if you may interest him with a cookie. Asking me if I want a free Michel Richard cookbook is like asking a leech if it cares for a squirt of fresh blood. In a phlebotomic manner, I lunged at and latched on to the book. You should see my copy of Happy in the Kitchen; several of its pages show undeniable evidence of having been licked. The pages where this recipe is found are warped and cockled beyond recognition. 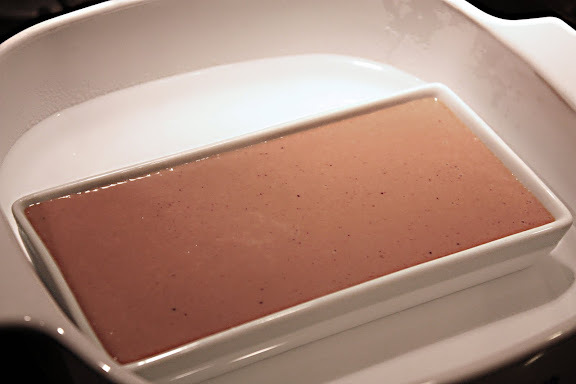 What makes this chicken liver mousse different from the familiar terrine de foies de volailles or the various versions of chicken liver pâté is the fact that the chicken liver is not cooked before it goes into a mold. Instead, it’s puréed right along with the other ingredients to form smooth-as-silk liver cream. The mixture is then baked in a bain marie, resulting in the smoothest, creamiest, most delicious pseudo-foie gras you’ve ever tasted. It glides, slides, slithers, and glissades on your bread like soft butter. And why wouldn’t it, with one whole stick of butter in the mixture? The question you may have at this point is – Is the gelée necessary? The answer is yes and no. Personally, though the fresh herbal taste of the gelée provides is definitely welcome, I don’t think this liver mousse really needs anything else to make it better. 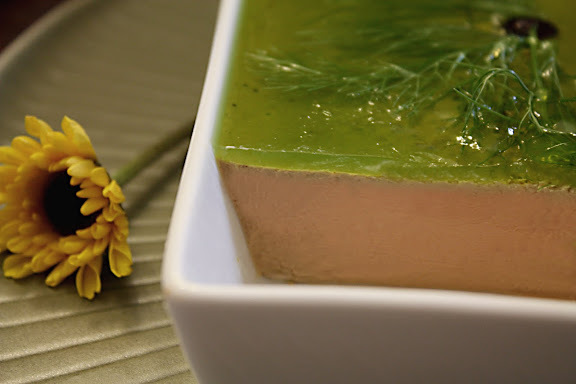 However, the gelée serves as a layer of protection against oxidation to which the surface of the cooked mousse is susceptible. This is why the French traditionally cover dishes such as this with some kind of gelée or aspic. Having said all that, it is up to you to keep or skip this extra step of making the gelée. Should you opt to go without it, be sure to scrape off the discolored portion on the surface of the mousse before serving. I’ve simplified Richard’s recipe a bit and also halved it as this liver mousse doesn’t keep very long. It’s so rich that only 5-6 bites will satisfy you in one sitting. But if you’re cooking for a crowd, by all means, use the full recipe by doubling what I’m giving you here. The full recipe makes approximately 1 quart of liver mousse which is enough as an appetizer for about 12 people. To make 1/2 quart mousse, start off by getting some boiling water handy and deciding what serving vessel(s) you would like to use. I like to use my 16-ounce rectangular ceramic dish. You can use something similar or two 8-ounce ramekins. Whatever it is you choose, this will be your serving dish as the mousse is served in the same container in which it’s baked; there’s no unmolding involved. Metal is a bad idea. Glass is okay, though a bit strange to the eye. Ceramic, I think, is your best bet. Once the issue of serving vessels is settled, find another pan big enough to fit your baking container(s) into and deep enough to hold hot water whose level is supposed to come half way up the sides of the serving container(s). If you’ve baked anything au bain marie before, you know the drill. Once that’s done, preheat the oven to 300 degrees F.
Then saute one small onion and one clove of garlic, both finely chopped, in 1 tablespoon butter in a saucepan over medium heat. You just want to soften the onion and garlic, not caramelize them. Once the onion and garlic pieces are softened, add 1/4 cup of heavy cream to the pan, cover, and gently simmer 2-3 minutes until the onion is very soft. Pour the liver mixture into the baking/serving vessel(s) of your choice. Tap the bottom(s) of the dish(es) lightly against the countertop to get rid of air bubbles. Then place the filled dish(es) inside the larger pan. Place the pan in the oven and carefully pour boiling water into the larger pan until the water is half way up the sides of the baking dish(es). Baking time will vary depending on whether you bake the whole thing in one big pan or divide it among smaller dishes. It takes about 20-25 minutes for the mousse to cook in my 16-ounce ceramic dish. So if you use smaller containers, I’d check for doneness after 10-15 minutes have elapsed. You know the liver mousse is done when the mousse is set around the edges and the center is only very slightly jiggly. Remove the baking dish(es) from the pan and let the mousse cool to room temperature. In the meantime, make the gelée. Choose your favorite green leafy herbs or vegetable (parsley and fennel fronds are used here). Take about a handful of it and blend that with 1/4 cup of water, a squeeze of lime or lemon, a pinch of salt, and a pinch of sugar, until liquefied. Strain the mixture through a cheesecloth or coffee filter-lined sieve to get a completely clear, sediment-free green liquid. Whisk 1 teaspoon of unflavored gelatin powder into the herbal liquid and microwave it just to melt the gelatin. Do not allow the mixture to boil. 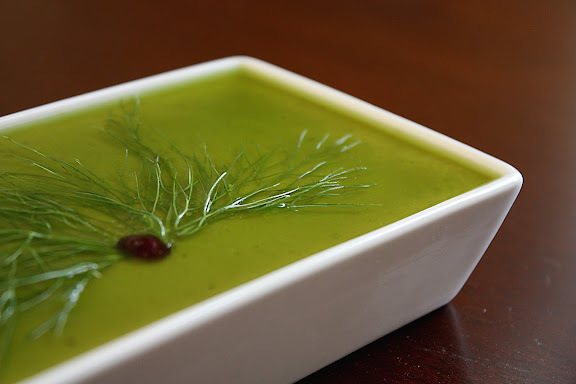 Arrange fresh herb leaves, shaved carrots, or whatever strikes your fancy on the top of the your mousse, then submerge and seal them in place by pouring the gelatin mixture over the entire surface of the mousse. Refrigerate the mousse for 4-6 hours. Refrain from touching the surface of the gelatin lest your fingerprints become evident for all party guests to see. Just let the thing set undisturbed. The assembled mousse can be made and refrigerated up to 3 days in advance. For best result, let the mousse stand at room temperature for half an hour before serving. Wow it looks really smooth and perfect! I happen to like the layer of gelée, it often complements the liver quite well. I wish I could taste some of your liver mousse, it looks soooooooo gorgeous! Oh, wow, this looks heavenly! I love the gellee layer! I just made a chopped liver pate that I will post soon but it’s really so inferior in comparison to this stunning mousse! Thanks so much! I’ve been making chicken liver pâté for years, as part of my Christmas dinner contribution. I’m thrilled to try a new recipe, very different from my own. I really appreciate your sharing, and we’ll be drinking to your health at our Réveillon! What a beautiful dish!Great for the holidays! oh OH! what a decadent looking dish, i am drooling over it and i’ve already emailed the roommate that *this* is what i want to make when i’m ready to play with animal liver parts. Wow. This is a work of beauty. A masterpiece! 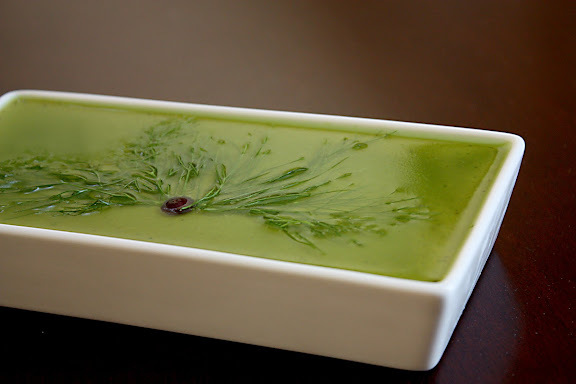 And the parsley and fennel gelée is beautiful too. 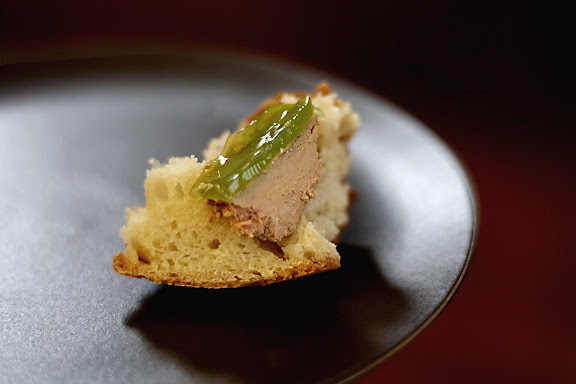 I can’t say I’ve ever tried liver mousse, however, your photo was so beautiful it makes me want to try it! Absolutely gorgeous photo… I just got chicken liver and will make it for the holidays…. you have really put a party dress on the normally drab mousse with the gelée… brilliant. My first visit you your blog and i’ll be back soon! I love Michel Richard and need to unpack his cookbook to discover more gems like this. The pictures are so stunning, I’d almost, almost think it a shame to have to disturb the beauty of the fennel frond. What a great look, and another sure winner to add to my growing list of your recipes – there are just not enough hours in the day. Beautiful mousse and gelee! And, I love that book. I have to try this. Hey Leela! This mousse was a hit at our Christmas party! Thanks for the recipe. It’s funny that you call this “pseudo” foie gras. I was thinking this is just like what I used to get in Paris. Looks phenomenal, Leela! This is a fantastic recipe. 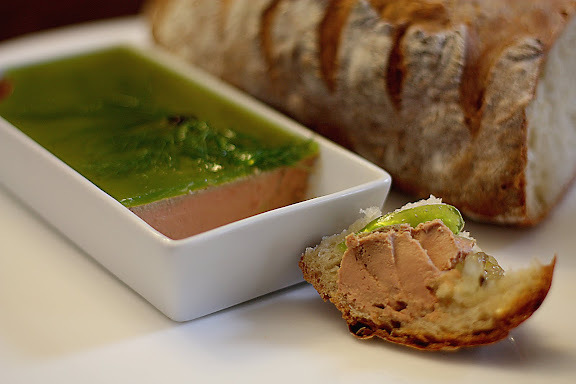 I have been making pâté de foie for years with a simmer-the-liver-then-puree-with-butter-and-refrigerate recipe. The ingredients are the same, but I find this method much better: smoother and silkier in texture. I quadrupled the recipe, skipped the gelée and had superb results. Worth keeping, many thanks! Fabulously gorgeous…. easy, and absolutely delicious! I added a splash of cognac with the cream… yum… THANK YOU! I was concerned that the fennel leaves might be too tough to slice through, but it was not a problem once the terrine was cold enough. I did not strain the mousse, but I did strain the aspic. 2) My mousse ended up a lot redder than yours. Did I skip some preprocessing step or are there different kinds of livers? 3) The mousse could use a bit of extra depth. The next time I’ll definitely add cognac. Or butter. Or both. I have made, oh, 7-10 batches after this post went up and found myself increase the amounts and number of different flavoring agents along the way. Salt is one of those things that can be reduced or increased to taste, so have fun with it. You may always want to add ground allspice and more pepper. I really love the flavor of allspice in this. I made one batch with added vermouth and that went very well too. Your cognac idea sounds really good, so I will definitely try that next time. Colors of chicken liver vary quite greatly. I’ve been getting anything from red to pinkish to yellowish and these have resulted in varying mousse colors as well. Ooh, vermouth. Brilliant idea, thanks. The best part of the recipe is that it’s so simple (if you manage to keep the cats away from the kitchen while the liver is out) so the threshold for experimenting is low. 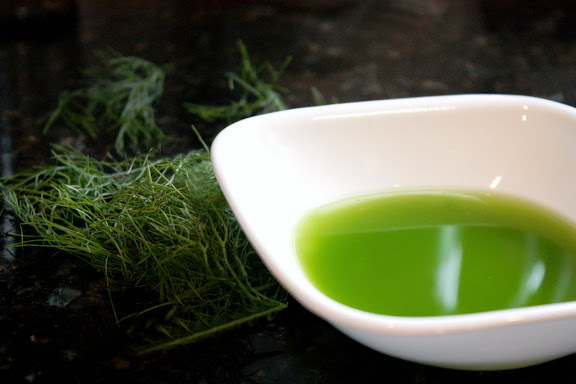 Matias – Freezing causes Chlorophyll degradation; that’s why the frozen dill didn’t give you enough green. Chicken stock would be fine. You don’t get any color, but you’ll sure get additional savory flavor to make up for it. I’m sure it’s going to taste good too. I can’t wait to try this recipe especially with the green gelee layer on top. What is at the center of your fennel fronds? I’m making this for my mom for mother’s day! I hope it turns out well. Serving it with pear jam and crusty bread. J – Ha. It’s been a while; I almost forgot what that was. It’s actually a fresh cranberry half, cut side down. Indeed the best and most beautiful chicken liver mousse. Out of this world, totally morish, paired with your incredible fennel and green apple confiture. A great introduction to your morish blog! Many thanks from the UK. Leela, if you were to cook the liver mixture sous-vide (as opposed to the bain-marie), what temperature and time would you go for? Daniel – It’s never occurred to me to cook this sous vide, so I have no idea. Sorry. Anyone want to help, Daniel? In response to the sous vide question, I would cook it at 275-300 degrees or whatever the equivalent is on the machine you use. Assuming you want your pate cooked through, which is what I tend to prefer given that it is chicken after all, you want to cook it to 165 degrees. Personally I think the sous vide method would be excellent, although the presentation could be iffy. You could try to mold it into a cylinder before cooking it. Good luck! I made this (without the aspic) sous vide, or strictly speaking not under vacuum but sealed in a Ziploc quart bag, double what was made here. It was my first sous-vide attempt. I put it in a 150F bath for 16 hours (it broke the surface a bit and I worried), turning about halfway through. Disconcertingly pink inside but thoroughly cooked and delicious. Used brown shallots instead of onions. A good idea, that cylinder. Sous videing the mixture in one of those white 10x6cm souffle ramekins could work. That is a cylinder. My PolyScience iPad app tells me that, for a cylinder of poultry with a 100mm diameter, at an FDA suggested 74 C water temperature (more than ‘well done’), one will need a cooking time of close to 9 hours and 31 seconds. With an initial temperature of 5 C, out of a cold fridge. That will cook and pasteurise the ‘faux gras’ to the core, according to the app. A querry for ‘foie gras’ with the same parameters (a 100mm diameter ramekin, 5 C initial core temperature) returns 9 hours and 11 minutes cooking time at a water temperature of 71.1 C. That will also cook and pasteurise the ‘faux gras’ to the core, according to the app. Let me test that a revert. I made this recipe recently, but substited the butter with rendered chicken fat. Really enjoyed making this recipe!